How about a Gift Make? Make a Handmade Gift, Perhaps you want to send more than a just a Thank you Card to somebody? Or Possibly have a last minute Christmas Gift to give to somebody who you haven’t seen yet? Maybe like myself have a birthday to prepare for and want to make that extra special Gift from the heart? Perhaps you got a last minute Christmas Gift to make, for somebody you not had a chance to see over the Festive times? Whatever the Reason, Make us a Gift and enjoy the Challenge. 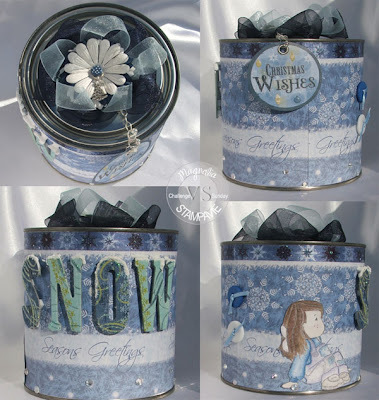 So i made a Gift Tin for a Family Friend who we hadn't had chance to see for Christmas as they don't live in the UK, We got to see them and i handed over a Altered Paint Can that was filled with Treats for them. I wasn't able to get a photo of the actual tin i gave, as i had forgot in the excitement. But i did the same tin as the one in the photo not so long ago for Lorraine as a little gift. The only difference was Tildas Hair was coloured slightly different. This entry was posted on 11.1.09 and is filed under Magnolia Stamps , Magnolia Vs Stampavie Challenges , Other Stamping Projects . You can follow any responses to this entry through the RSS 2.0 feed. You can leave a response, or trackback from your own site. Gorgeous tin Donna, the papers are lovely and the image is so cute.